I loved the variation of clouds and colors in the sky one day this past week. Hope you enjoy it too!!! 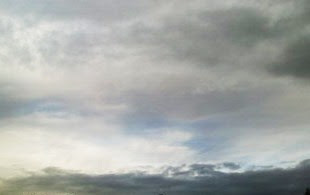 View some beautiful skies at http://www.skyley.blogspot.com/. Will be at a volleyball tournament all day today. The team had their first two matches of the season Thursday night and won them both! One of them was their biggest rival. Have a great Saturday...catch up soon! So that's what clouds look like. Volleyball tournament cool i love playing volleyball even i am also a player..